Thanks to everyone who responded to the request for help by a long time subscriber – his concern is the trade off between BO's current emphasis on creating jobs & what he perceives as the Tea Party & Republicans focus on deficit cutting. He feels BO's jobs' position is a political winner & the Tea Parties' deficit cutting position is a political loser between now & 2012. I am gratified that our subscriber looks to us for an answer to his question because he could get opinions from any news source he wants. His faith & trust I do not take lightly & neither did the eleven people who took the time to respond. I sincerely thank everyone who wrote a response. They are excellent & not one of them is the same. Frankly, they are too much to read & digest in one sitting so I have posted all of them, including mine, on ReturnToExcellence.net. Just click on this blog & go to the subject posting dated September 14, 2011. Reading them will be well worth the effort & a small one compared to the time & thought put in by the writers who tried to help a friend. The Tea Party was formed right before April 15, 2009 catalyzed by the Bush & BO Stimulus spending packages. Indeed the Tea Parties were originally created to fight & resist the large deficits that resulted from these spending programs with no or little direct discussion about job creation. It is important for Tea Partiers to not cede the current jobs issue to BO who could not care less about helping create one job – he is really only about saving one job – his own. BO’s American Jobs Act was unmasked Monday night as being no more than a tax increase in disguise when it was revealed that the $447 billion of outlays & tax credits that make up the act would be offset by $467 billion of pure tax increases mostly by limiting deductions on millionaires & billionaires who make over $200,000 per year – by anyone’s definition, including BO’s, a $20 billion tax increase. Tea Partiers can claim ownership of the jobs issue by pointing out that spending cuts are stimulative & job creating in their own right because entrepreneurs will not fear tax increases when the size of government is shrinking. Source Harvard Professor Alberto Alesina who has research evidence from the last 40 years to support this position. To win the day on the above will require a candidate from the Tea Party who is a knowledgeable public speaker- one who will show that BO’s plans are a disguise not aimed to create jobs but rather to complete the socialization of America for starters. But the first thing such a candidate has to do is explain that deficits are not the problem - spending is. It is better to have a budget of $1 trillion with a $500 billion deficit than a budget of $2 trillion with no deficit. Absent such a candidate our subscriber’s concerns are justified because BO’s false job creating programs will electorally trump the Tea Parties’ genuine attempts to control both spending & the deficit. Ever hear of Elmer Wheeler??? He was one of top salesman in America - his theme - sell the sizzle, not the steak. The sizzling of the steak ,wets peoples desire to eat it, not the cow, even though the cow is needed. how they would create jobs, in simple terms that make sense - they can win. My own view - it is difficult for both parties to come up with fair solutions . Extreme deficit spending doesn't create jobs...Giving someone borrowed money to look busy for a year is not a job created. We tried this, (even though we should have known better then) two years ago, and it didn't work. While there may be a few useful projects, this is basically a money dump on the unions (and un-employment). Of course some deficit spending is sustainable,but we're starting to look a bit much like Greece. Finally, you speak of politics...if the Republicans were politically motivated, they would pass Obama's bill. We would be worse off next year...It would be totally Obama's economy, and the liberals would still blame Bush! I got your message and looked at the response. I'm not sure if they are referring to what they think voters perceptions might be...or whether they don't personally believe both are possible. There are two great philosophies about government. You and I share the philosophy that government should be limited and bound by the chains of a contract. Free markets can do most things better than government. From that perspective, it is indeed possible to both cut the deficit and create the environment for jobs to grow. The tea party wants to get government out of the way which wuld save money and allow the private markets to create millions of jobs simutaneously. The FairTax is just one piece of that and although it doesn't actually cut government, it does create the environment for growth in the private sector. The Keynesians and most Republicans don't really favor giving up their power however. Republicans talk about cutting government but in the end, in exchange for democrats going along with favors for their friends, they agree to increase spending. That could describe the Reason tax cuts, where taxes went down, revenue went up but so did the deficit. Those in the tea party want to hold Republicans feet to the fire and force them to follow through. "Party Republicans – big business; Party Democrats – big government; Tea Party – big individuals (personal responsibility and limited government)"
"Government takes dollars from the future earners to create temp jobs today; Entrepreneurs take their own dollars today to create permanent jobs for the future"
"Today the US is a mixed market, not free market system. Large govt involvement (distortion) creates illusion to some that free markets don’t work"
"When two ideas move in opposite direction, there can be no compromise. The compromise will always be towards one idea and away from the other"
"Free market solutions – To get what I want, I have to give others what they want. Government solutions – coerce others to accept my solutions"
"Invested capital increases production, lowers cost of goods, provides jobs and creates new opportunities. All this helps the poor"
Regarding the response #4 to the Obama speech. I think the writer is underselling the inherent intellegence of those who are not political junkies. They might not know that the cost of each 'new or saved' job was in excess of $275,000 (or the 'new' version will cost over $325,000 each) but they DO know that TARP & the Bailouts didn't work. They know unemployment is over 9%. They know that the 'Shovel ready jobs' did not exist. They also know the bulk of the jobs that were created went to workers in the public sector. How many times do you think you can you sell the same can of snake oil before the people realize what it is? Obama says he is not concerned about 'millionaires & billionaires', and wants to hire more teachers. That is good news if you are a teacher. But if you are a parent of a student, you know the problem with the schools is not a lack of teachers, it is the educational system that is broken. If Joe 6 pack has been in the private sector for any length of time, he knows that more government spending isn't the answer. All it leads to is bigger tax bills and more regulation over his life. They see the cozy relationship between Obama & Immelt and GE. They know that the Oracle of Omaha owes a Billion in back taxes, yet is whining to pay more. Just as I don't believe a political donation to a candidate does not 'buy' the candidate, empty promises will not sway a leery base. What the GOP & TEA Party has not done is explain that raising the taxes on the rich a couple of points is not going to do anything about the problem. You could tax the top 400 earners @ a 100% rate and we would still be $1 Trillion short for the year. You would need to double the tax rate, across the board, to balance this years budget. Of course that doesn't take into account those who would say screw it, I'm retiring. The other 48% would have to begin to pay their fair share too. I do think people are starting to get the fact that we are spending way too much. I think it would be a huge mistake for us to give up on the concept of limiting government and spending. It is at the core of our beliefs. To give that up would be admitting defeat. Hell, we are not defeated, we have just begun! Spread the word! The gentleman's comment; "times have changed since then," is simply not accurate. It is simply a continuation of bad economics and politicians looking to get re-elected not knowing or caring if what they say and do has good or bad consequences. This has gone on since ancient times. Obama is just another in a long line of incompetent "leaders." Obama does have a problem, he has lost any credibility on the issues of economics, jobs and the national debt. His speech was nothing more than rearranging the words and the same old phrases. Remember the "shovel ready" jobs? Same old, same old. Simply stated the only job the government can create is…. a government job. It can attempt to provide incentives but in doing so it takes assets from the private sector, and sqaunders them. This is how we end up with bloated inefficent government. When a private company does this (unless they are anointed "too big to fail in Washington") the only ones hurt are the employees, bondholders and stocholders. When the government follows this course everyone is affected. Right now to the tune of over $14 trillionevery US citizen is being impacted, not to mention being sold out to China and other foreign nations. The biggest problem for the Republicans are a) They stink at public relations b) too many of them are cowards or inept They allow themselves to be used by Obama and the Dems either through fear or ignorance. When Obama talks of "sharing the wealth he only gets away with it because the Republicans start having "intellectual discussions" on the topic. Instead they need to call him, Pelosi, Buffet, Clinton and every other phony out on the "share the wealth" issue. Demand the Dems start "sharing their wealth" and they will clam up. If the Democrats want to use class warfare, use it against them. Frame the argument. For example demand to know how many houses they own and are they letting "homeless people" stay there? If the answer is no, inquire why not. Once you get them to back off, we can then begin to educate the American people on the biggest problem we have, namely the US tax code. Until it is changed, there will be no real job creation. Until the Republicans learn how to explain economics and their positions, they will continue to be outmaneuvered. BO and socialist leaning Democrats and elite media have huge advantage advocating public jobs and spending programs while downplaying debt reduction. 2 - Electorate is used to welfare and entitlements and will very reluctantly relinquish. Electorate only weakly understands debt finance analyses let alone impact of debt to GDP ratios. He again presents an exhaustive economics analysis of where we are headed due to our increasing debt. Very few in the US understand that we are truly playing with fire. Once our foreign creditors start viewing our Treasuries as toxic our economy may enter an unprecedented disaster. So what should our strategy be? 2 - bloggers and alternate media are on rise. Let's accelerate impact. Challenge all media elite myths about the economy. 3 - Is politics too controversial with friends, family, coworkers, neighbors? Definitely not now. However focus on economic not political strategies. Discuss hard facts such as public jobs spending create temp jobs which are lost if spending stops thereby mainly increasing deficit. Discuss also risks in financing our debt by foreigners. 4 - prioritize private economic growth policies which will decrease need for cuts. 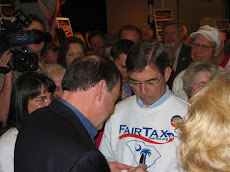 Promote the Fair Tax as a measure to increase jobs and economic growth. 5 - strongly advocate many cuts that can be made before touching entitlements. These include privatizing the PO and Amtrak, eliminating education and energy depts, defense cuts. 7 - get involved very strongly in campaigning for the right candidates. It’s simple. If you want to have the government take your savings, your 401, and your pension and give it to others vote for Obama. To more easily understand the jobs versus debt relationship let’s look at a situation where in a family of four, the husband who is the sole income provider, losses his job. At this point the family has several possible courses of action. 8) And, I almost forgot this one. Force the youngest child to invent a new technology that that has no market and solves a problem that doesn’t really exist. The correct answer in Washington is to implement a tax system that enables and encourages American companies to invent, manufacture and sell products that are wanted and needed globally. 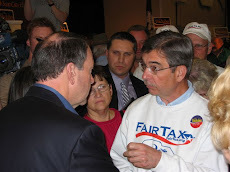 The Fair Tax (HR-25) has the potential to have a profound impact on all facets of our economy. It would help bring money in from outside our economic sphere, it would create high paying jobs, it would promote the growth of second tier companies to support the larger companies and it would create more entry level and lesser skilled jobs (everyone could participate productively in our society). And yes, along the way it would increase Government revenues in a fair, transparent and equitable manner. The Government needs to let our family solve its own problems by leaving us alone. The American spirit simmering below the surface and only needs a spark of encouragement to ignite into raging industrial fire. To paraphrase a JFK quote, this could be the tide that lifts all boats. Doug, I have a different take compared to some of the other comments. Has it been forgotten why the face of Congress changed in the last election? Congress did compromise resulting in their low numbers, Republicans compromise way too much with each and every bill. Releasing the choke on our energy will start the regain of prosperity for all. Don't forget who is running the shop, a bunch of socialists who in their heart hate capitalism and any one with a religion. Watched a documentary on Hitler - the same things are being used today as then. Talked to some on the internet, they despise anyone with a 25 cent piece more than them.